Professor Meir Pugatch spoke together with Tom Donohue (President and CEO of the U.S. Chamber of Commerce), David Hirschmann (President and CEO of the U.S. Chamber of Commerce Global Intellectual Property Center) and former Director of the United States Patent and Trademark Office, David Kappos, at the launch of the fifth edition of the U.S. Chamber’s International IP Index in Washington D.C earlier this week. 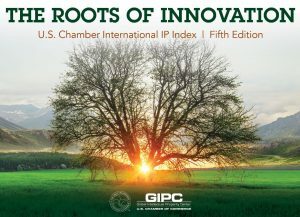 Titled: The Roots of Innovation, this edition maps and benchmarks the intellectual property environment in 45 economies, which together account for over 90% of global gross domestic product (GDP). On the whole, while challenges and setbacks still exist across the board – particularly in emerging markets and the BRICs – many of the benchmarked countries have taken positive steps and improved their IP environments. The Index also includes a special annex which underscores the benefits experience by countries as they strengthen their IP environments by correlating the Index’s scores with 21 variables reflecting key economic activities. 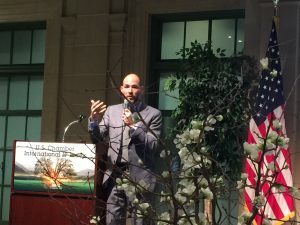 In fact, most of these correlations have strengthened with respect to the Index’s former editions, illustrating an even more compelling picture that IP rights support national efforts to build innovative and competitive economies.